Intense color, displaying well on its thin matrix. Individual crystals, isolated and with excellent luster and color. 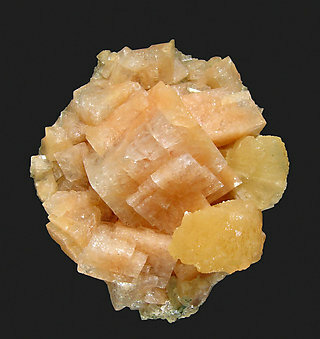 Surrounded by small crystals, this is a parallel growth of Chabazite crystals, with well defined edges, and no damage. 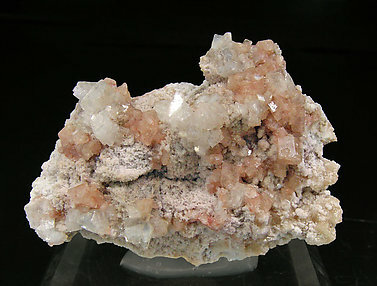 They are on a matrix of Stilbite and small crystals of Scolecite. 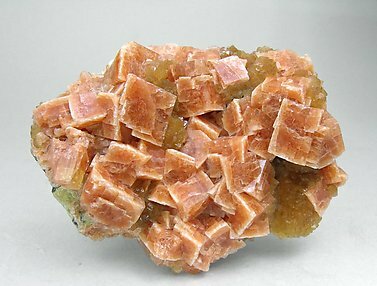 Chabazite is not a common mineral in this region, so this is unusual as well as esthetic. 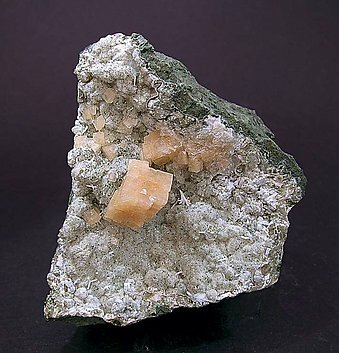 The samples of Chabazite (probably Chabazite-Ca) from this locality are scarce. 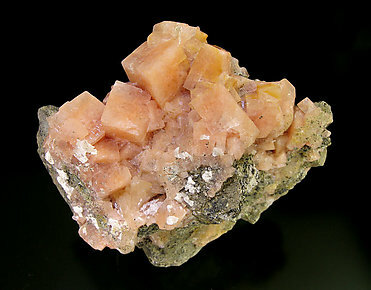 The crystals, on matrix, are small, with a pseudocubic appearance, good transparency and luster and slightly pinkish color, contrasting with the white crystals of Heulandite-Ca. Group of orange pseudocubic crystals on a matrix rich with globular growths of Stellerite crystals. While quite abundant some time ago, they are actually not seen on the market anymore. One of the novelties from Ste. Marie-aux-Mines 2007. 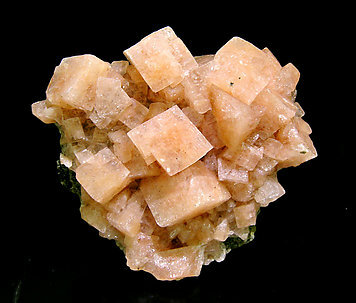 The crystals of Chabazite-Ca look cubic because the angles of the rhombohedron are nearly 90º. Stilbite-Ca crystals form bow-tie growths.